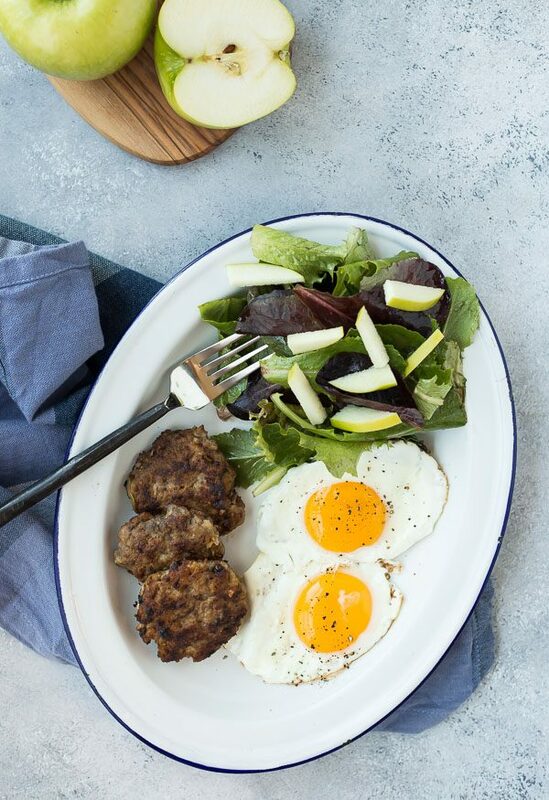 Even if you’re not doing a Whole30, this Whole30 Sausage is a breakfast WIN! It’s full of flavor and protein and it’s super easy to make thanks to a couple shortcuts. 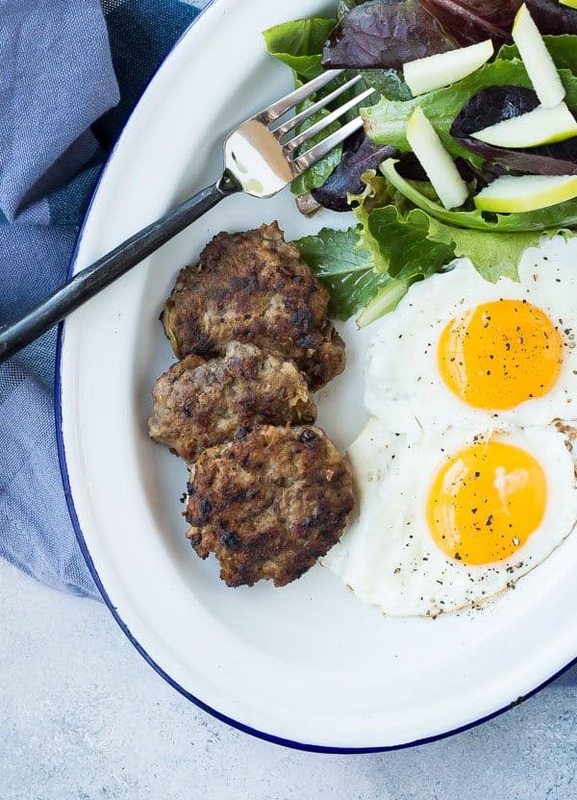 You’ll be so happy to know exactly what’s going into your breakfast sausage! 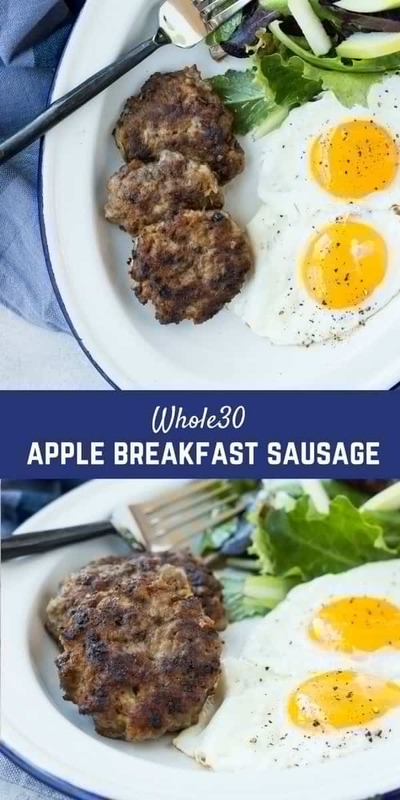 I was a little hesitant to actually title this recipe “Whole30 sausage,” because it’s so good and not something that only Whole30-ers can eat. I know I’ll be eating it before, during, and after my Whole30. However, after doing a bit of research, it appears that a lot of you are searching for Whole30 sausage, and I aim to please. 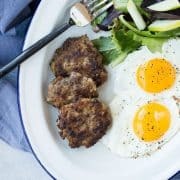 If you came here after searching for a Whole30 sausage recipe, rest assured this fits the bill! If you’re just looking for a delicious pork and apple sausage recipe free of all the weird ingredients you find in some grocery store sausage, you’re in luck too. 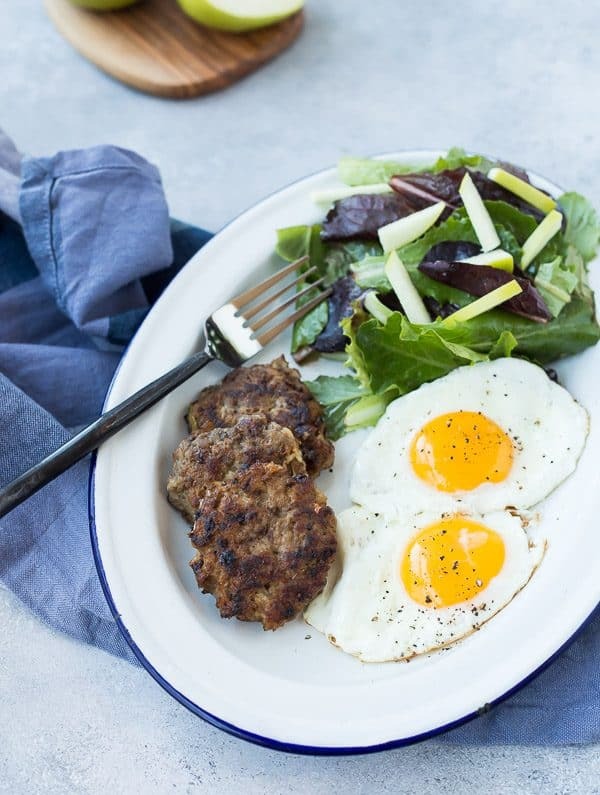 If you have done a Whole30, you probably know that Whole30 compliant sausage can not only be hard to find, but it can also be very expensive. This is such a great solution because it isn’t hard to make, and you know exactly what you’re putting into it. The idea for this recipe was actually inspired by Melissa Hartwig’s latest cookbook, Whole30 Fast & Easy. In this cookbook, there is a recipe for pork and apple meatballs over spaghetti squash. I made those and after tasting them, thought they’d translate really fantastically into a breakfast sausage recipe. I made a few changes and the result is absolutely delicious. I know I say every recipe is easy, but it’s true. I only have time for easy recipes so that’s all I typically share with you guys. I know you’re all busy too, so why bother with complicated recipes when you can have something delicious with so little effort? The process of making sausage patties is similar to making meatloaf, meatballs, or even burgers; you just form it into a different shape. Mix ground pork with all other ingredients in a large bowl. I like to use my hands but if that grosses you out, use a spoon. Shape into small, flat patties and fry in a frying pan. Pork has quite a bit of fat naturally, so you don’t need a lot of ghee or oil to fry these in. That’s really it! When I remove them from the pan, I do put them on a paper towel lined plate because they can be a bit greasy, but it’s completely optional. I don’t sauté the apples and onions like Melissa does in the meatball recipe I adapted this from. I also don’t peel the apple — I’m all about keeping things simple and easy! If any large pieces of apple peel come off when you’re shredding the apple, you can discard those, but the little pieces of apple peel cook right into the sausage and provide added nutrition. Since you’re shredding the onion instead of dicing it, it cooks right along with the sausage as well, making the extra step of sautéing unnecessary. Hooray! One more note about shredding both the apple and onion – try to preserve the juice produced when you do this. It will add great flavor and moisture to the pork sausage. This is also super important if you’re choosing a leaner meat such as turkey or chicken — that moisture will really help prevent the sausages from drying out. Tip: If you have a grater that has a collection compartment, it works great for collecting those juices. I have this one that’s perfect for something like this! Turn up the heat! Add more cayenne or red pepper flakes. What to make it a little more lean? Substitute ground turkey or ground chicken breast for the pork. You’ll want to use a little more fat/oil when cooking them if you choose to do this. Freeze them! You can separate them into patties and freeze them either raw or cooked. If you freeze them raw, you can separate them into patties right in a freezer bag. 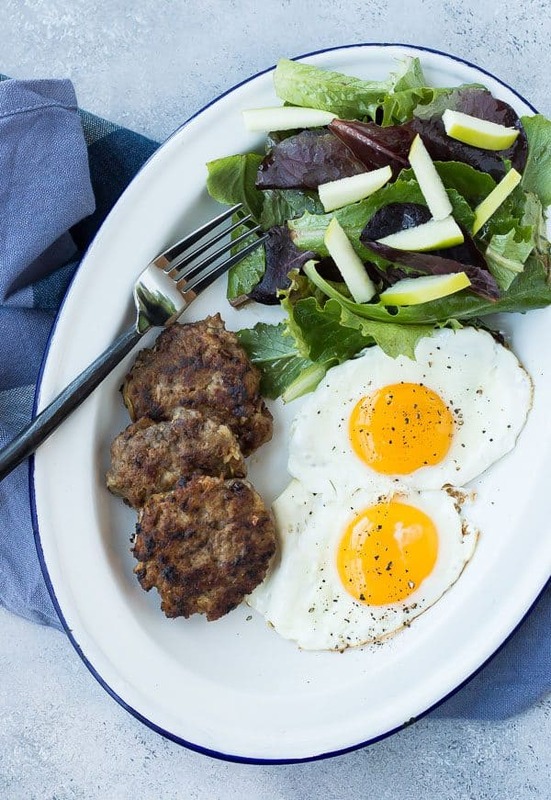 In her turkey breakfast sausage recipe, Rebecca shows a great visual of that technique. 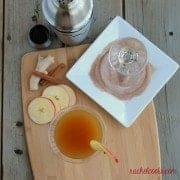 Serving suggestion: I love serving these with fried eggs and a crisp salad with apples to drive home the apple flavor. I’ve also chopped them up in small pieces to use in a breakfast hash which is delicious as well! They’d also be phenomenal on a breakfast sandwich if you’re not doing Whole30 – I’m imagining a soft, flaky biscuit and a runny fried egg….YUM. …or check out my entire archive of breakfast recipes! 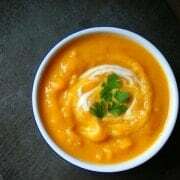 In a large bowl, combine all ingredients until all ingredients are evenly dispersed. Form into about 16 small patties, pressing them thin, and slightly thinner in the centers. Preheat a large skillet to medium-high heat. Add oil or ghee and sausage patties. 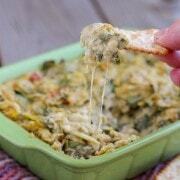 You will likely need to cook these in batches to avoid crowding the pan. Fry sausage patties for 10 minutes, flipping after 5 minutes. Patties should reach an internal temperature of 165°F. If they’re browning too quickly on the outside (before the inside cooks), turn heat down to medium. If desired, place on a paper towel lined plate to soak up some of the grease. Want to turn up the heat? Add more cayenne or red pepper flakes. Freezing directions: You can separate them into patties and freeze them either raw or cooked. Adapted from Whole30 Fast & Easy by Melissa Hartwig. Verdict: I love this sausage recipe. I eat a lot of ground turkey but you just can’t beat pork when it comes to sausage. So good! Husband’s take: Ben ate these with no complaints! We didn’t talk much about them, to be honest. In the mornings it’s kinda “Good morning! How did you sleep? *kiss kiss* I love you, have a great day!” and that’s the extent of our morning conversations as we both hustle out the door. Changes I would make: None are necessary but if you want to make them your own, check out my suggestions above. 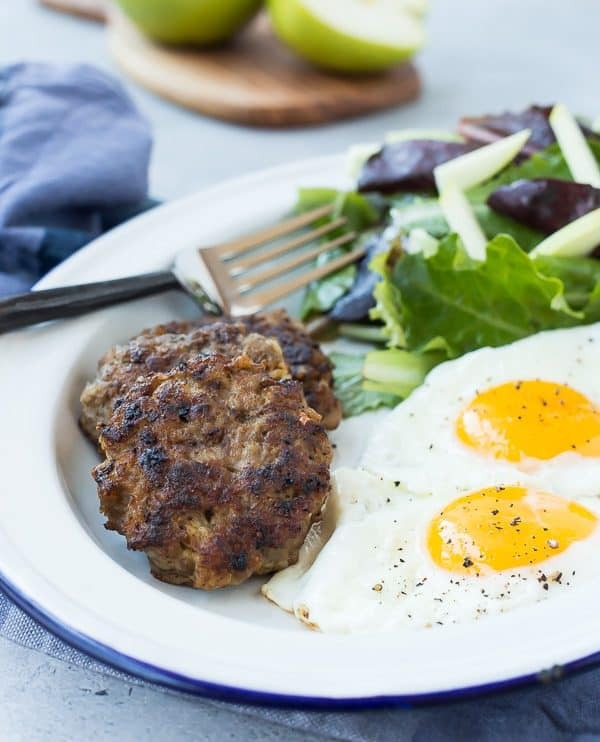 Hey there… I am having a difficult time locating Whole 30 approved ground pork. Can any one point me into the right direction? Or brand? Hi Morgan! I’ve had good luck with US Wellness Meats, and I know other people like Butcher Box. You should also be able to get plain ground pork with nothing added from the butcher counter at your local grocery store. One more comment, I made these today (I still make them often!) and I accidentally used green chili powder from New Mexico instead of the sage. OOPS! THEY ARE THE SAME COLOUR OK?! So I decided to spice them up with cayenne also. They were SO GOOD! I just wish I had pickled jalapenos for the top, and more salsa! The green chili worked really well with the sweet apple flavour. Ooooh I’m liking that! I’m going to have to try it! Thanks for sharing…glad it worked out! So glad you like this one! Thanks for leaving a comment! they were delicious with a courtland apple. I only had 350g of pork so I skipped the egg as I figured it would make the mix too wet. They held together fine! Hi Rachel, these look great! I’m a little familiar with the Whole30 diet, but not completely. Could you possibly do a future post of a day in the life of eating a Whole30 diet (basically what you had eaten for a day or two)? That’s a great idea! I did a post about some of my must-have tools and recipes during a Whole30, but a day in the life would be fun! If you follow me on Instagram, I also share a lot of my meals there when I do a Whole30. This is a great sausage for any time of year!